The Sd.Kfz. 251 (Sonderkraftfahrzeug 251) half-track was an armored fighting vehicle designed and first built by the Hanomag company during WWII, and based on their earlier, unarmored Sd.Kfz. 11 vehicle. The larger of the pair (the Sd.Kfz. 250 being the lighter one) of the fully armored wartime half-tracks of the Wehrmacht, the Sd.Kfz. 251 was designed to transport the panzer grenadiers of the German mechanized infantry corps into battle. Sd.Kfz. 251s were the most widely produced German half-tracks of the war, with at least 15,252 vehicles and variants produced by various manufacturers, and were commonly referred to simply as "Hanomags" by both German and Allied soldiers. This kit comes in a large shrink-wrapped tray and lid type box. 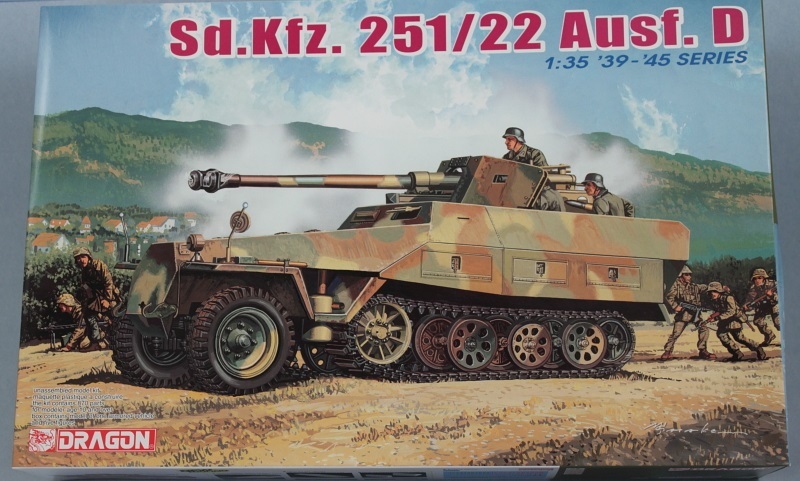 The box art shows a Sd.Kfz. 251/22 Ausf. D on a grassy field. The 3 man crew shown has just fired the 75 mm gun and a cloud of smoke is rising from the barrel. In the distance behind it is a village of white buildings and mountains in the far distance. There are 5 infantrymen around the vehicle. It is in a faded overall earth yellow with a wave pattern of red-brown and dark green over it. It is totally unmarked, without even a German cross. Side panels are festooned with illustrations of features of the kit. One side panel has a color profile of a Sd.Kfz. 251/22 Ausf. D in overall earth yellow with large blotches of red brown and dark green with no markings shown. 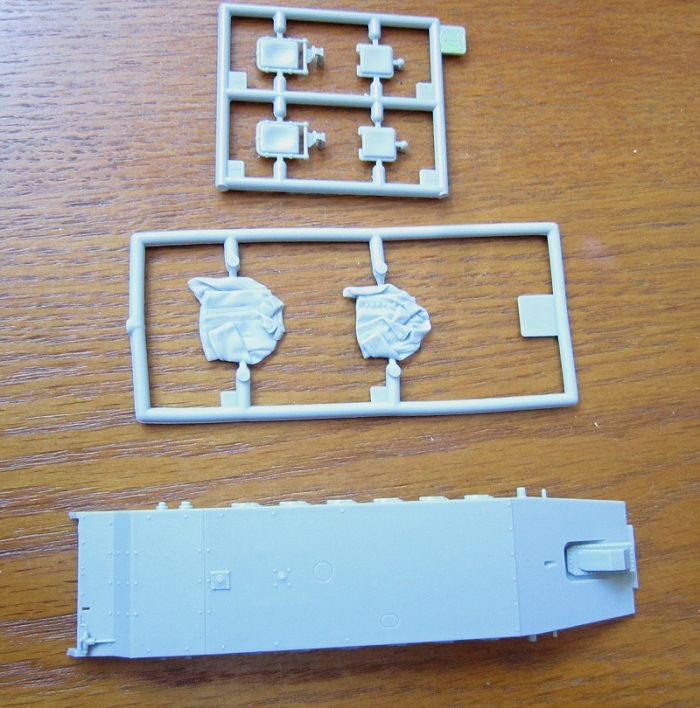 Completely new upper hull and engine hatch for Sd.Kfz. 251/22 Ausf. D late version. New Sd.Kfz. 251/22 Ausf. D interior configuration. New Pak 40 mounting and gun shield. A large BONUS decal, a license plate decal and 2 marking decals. 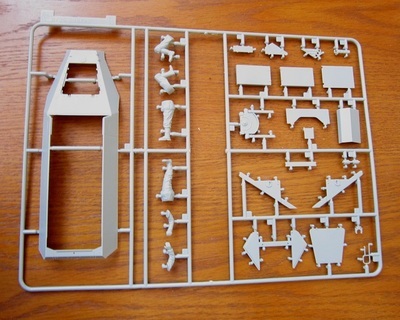 Next to these are CAUTIONS in 6 languages including English, a statement that the kit is for modelers over 10 years of age and not for kids under 3 due to small parts. Dragon’s European office in Austria’s street address is provided. The copyright of 2004 above Dragon’s street address in Hong Kong, MADE IN CHINA and Dragon’s web site address are provided. The other side panel repeats the color profile shown on the other side panel. 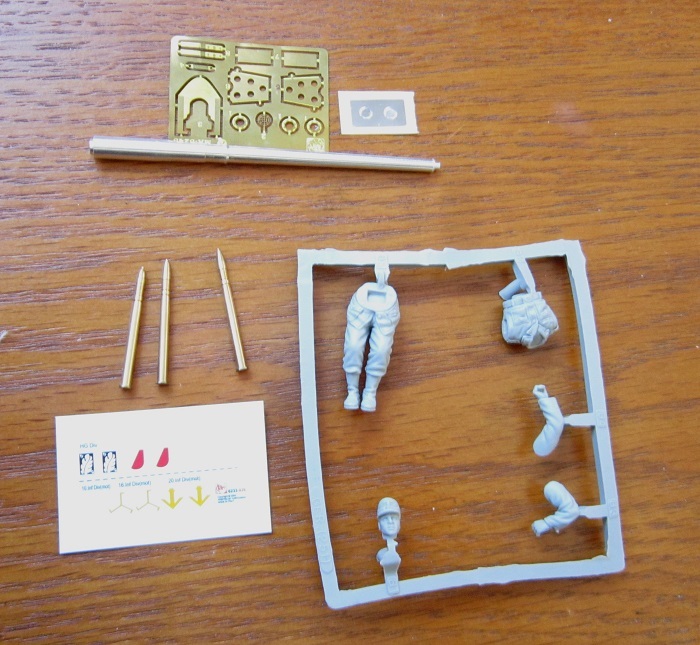 Photos of the turned aluminum gun barrel and the turned brass ammunition rounds are shown with along with the two vinyl uniform jackets, the 4 bonus crew figures and the extra vinyl driver figure are all shown in color. Regular early pattern individual tracks. E-Z late version individual tracks. Two types of plastic ammunition shell casing, ammunition tubes (open or closed) and wooden ammunition cases, 3 types of 3-D designed muzzle brake options. Workable breech (shell insertation is possible). Storage box with open or closed option (illustrated in color). The kit contains 966 parts (952 of these in light gray plastic) on 18 or more trees in 11 sealed cello bags. The single light gray hull tub part is in it’s own cello. There are 2 bags full of E-Z tracks, 4 turned brass 75mm ammo rounds, a turned aluminum 75 mm barrel, a fret of brass PE parts each in cellos. There is a very small decal sheet and 2 silver round stickers in a cello, a tree of rubberized parts in a cello, a tree of clear parts in a cello, 2 medium sized and one large decal sheet in a cello. The turned brass ammo rounds and all the things listed behind it are all attached to a card that has a raised tread pattern printed on it and they are all in a large cello. Very good packaging by DML! 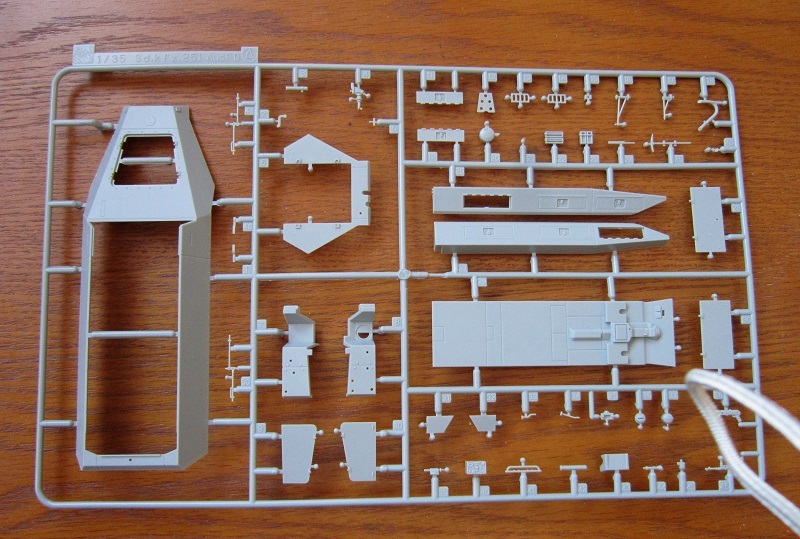 Light gray letter B parts tree holds: hull side panels, front vision plate, machine gun shield, an ax, the fire wall, hull nose plate, tow hooks, wood bench parts, storage bins, 2 MG-42 machine guns etc. (63 parts) 16 of these parts on this tree are blued out in the parts trees illustrations as being excess and not needed to complete the kit. 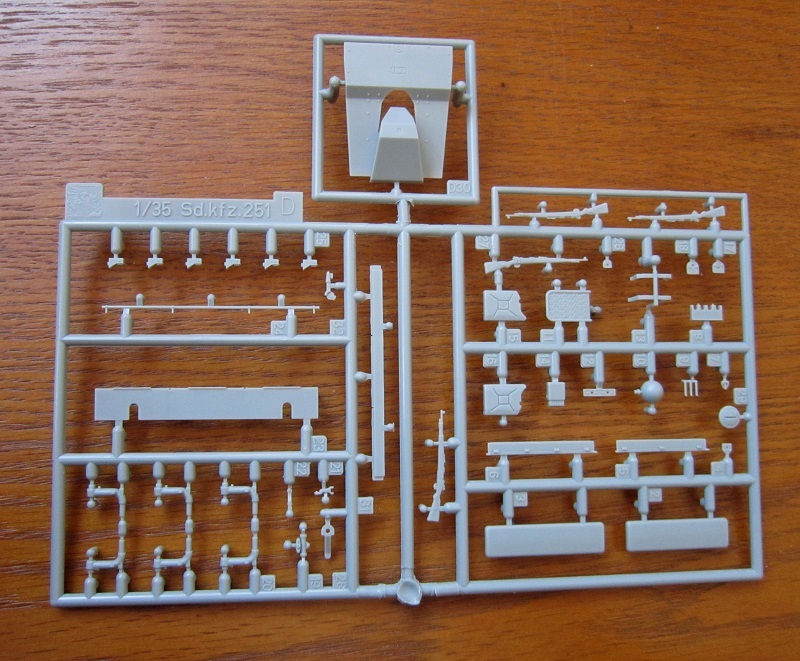 Lower case light gray letter b parts tree holds all the parts for the Pak 40 gun. (66 parts) One part is excess. 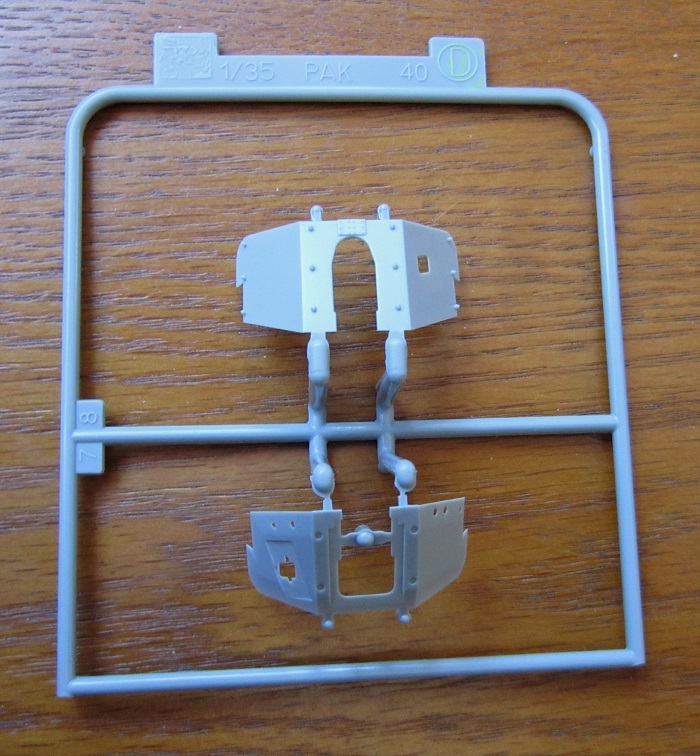 Light gray letter C parts tree holds: engine parts, a raised floor platform, the steering wheel, battery, shift levers, leaf springs, fuel tank, 2 MG-34 machine guns etc. (56 parts) 22 are excess. There are 2 identical light gray letter D parts trees. Each one holds: rifles, driver’s seats, jerry cans, front lower hull nose panel etc. (43 parts per tree). One tree has an extra part on it…the lower nose panel. 26 parts on each tree are excess. Lower case gray letter d tree holds 2 gun shield parts. Lettering now jumps to the light gray letter H part. It is the lone hull tub part. A non-alphabetized light gray tree holds: 4 crew figures (divided into separate heads, torsos, arms and legs. This tree also holds steel helmets, rifle ammunition pouches, a pair of binoculars, cloth equipment sacks, gas mask canisters, canteens, MP-40 ammunition cases, a pistol holster, and shovels in carrying cases etc. (55 parts). Another non-alphabetized light gray vinyl tree holds 2 uniform jackets. 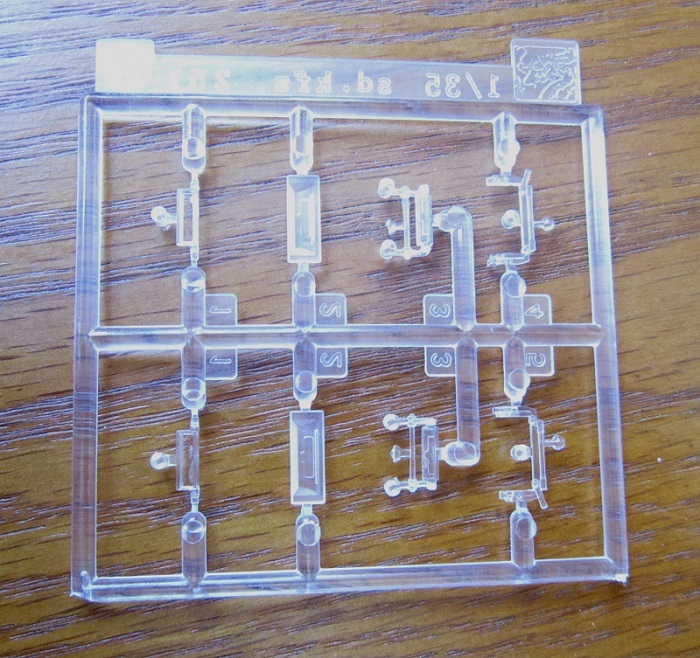 The clear parts tree holds 8 parts. 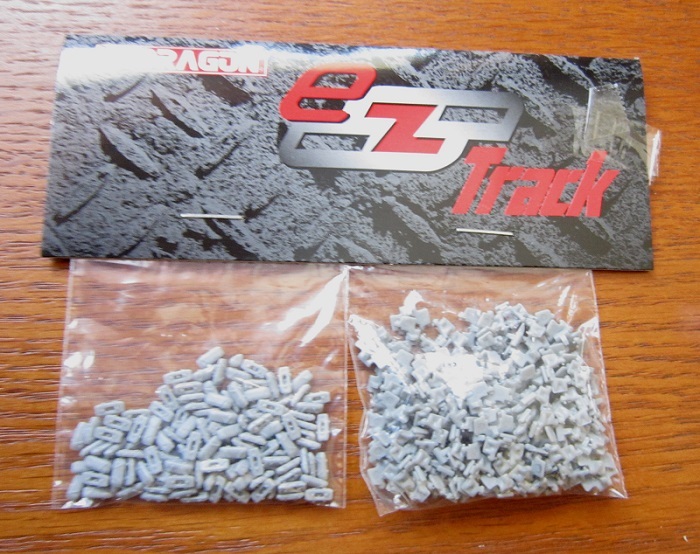 There are 2 bags of parts to do the E-Z alternate individual tracks. Each track link is composed of two very very tiny parts and I shudder to think of building them. The four turned brass Pak 40 rounds are next. The instructions say there are 2 types of these. I managed to loose one in the shag rug and the monster that lives there and eats model parts will not return it to me…groan. The turned aluminum Pak 40 barrel is next. 4 different decal sheets complete the kits contents. 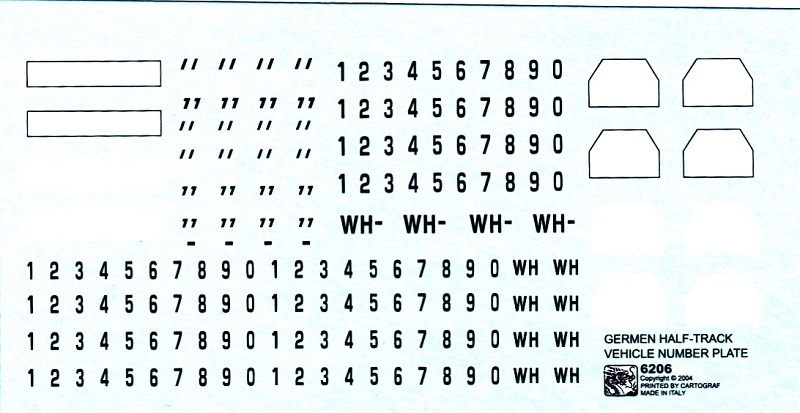 The largest of these sheets contains numerals in red, black and blue, 4 styles of German crosses, Polish checkerboard national markings and load information stencils. One of the smaller decals contains stencil marks for the Pak 40 ammo and cases and tubes. 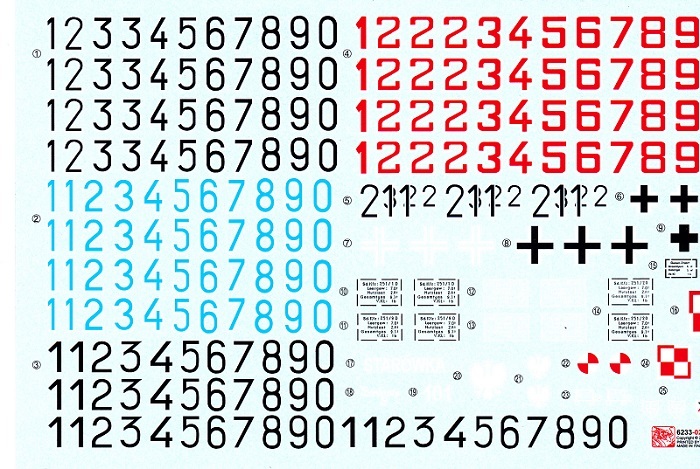 The third smaller decal has license plates and numbers on it to compose any number you wish. The smallest decal has some division marks on it. There are 2 circular silver stickers provided to do the rear-view mirror faces. The instructions complete the kit’s contents. It consists of a single sheet that accordion folds out into 10 pages in 8” x 11” format. Page 1 of the instructions begins with a black and white repeat of the box art, followed by the parts trees illustrations. Some trees have parts BLUED OUT. This means those are excess and not needed to complete the kit. 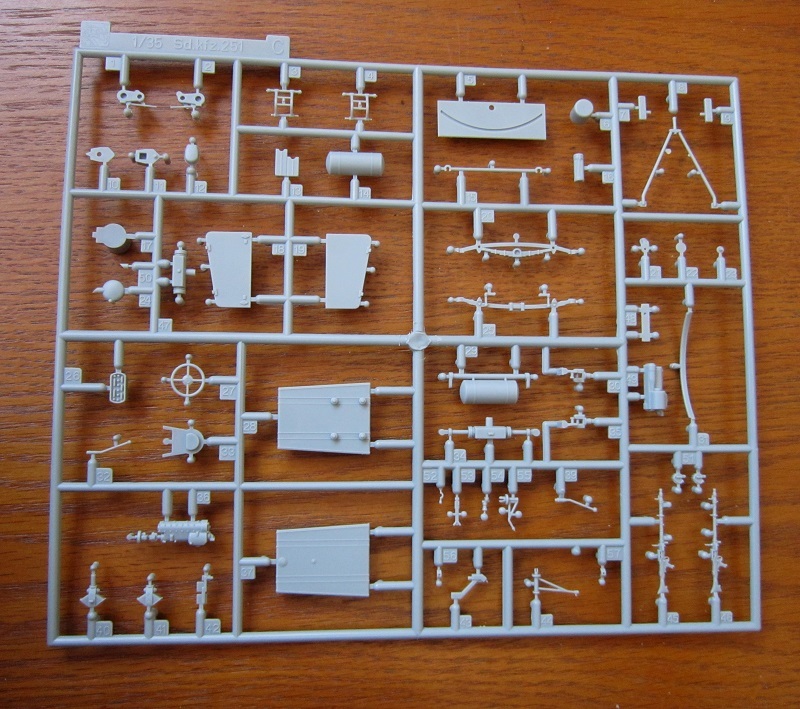 DML makes kits of several versions of the Sd.Kfz. 251, so some of these trees in this kit are the same as what is those other kits. Page 2 begins with CAUTIONS in 6 languages, including English, international assembly symbol explanations in 8 languages including English and a list of paint colors suggested to use to complete the kit. GSI Creos Corp. Aqueous Hobby Colors, GSI Creos Corp. Mr. Color and Model Master brands of paints sare listed. At the bottom of the page is the first 2 assembly steps. Page 3 through 8 give a grand total of 15 assembly steps for the vehicle. 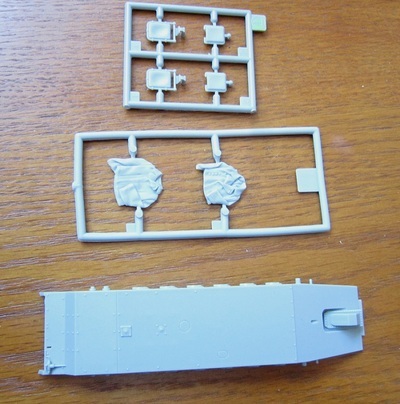 Page 9 gives the assembly and painting instructions for the 5 figures and the vinyl clothing parts and a 4-view illustration of a Sd.Kfz. 251/22 Ausf. D with an all earth yellow scheme with just German crosses on the side of an unknown unit. Page 10 gives painting instructions for the turned brass ammo rounds and their storage containers and where stencil marks get applied to them. Illustrations of 3 of the 4 decal sheets are shown. Below these are three 3-views of other painting and marking schemes. All three are of unknown units. The first one is in overall earth yellow with waves of red brown and dark green over it. The sole marking on it is the license plates on the front and rear with the number WH 1033829. The second scheme is the same 3 colors but the red brown and dark green are in tight wave pattern. This one has a number 48 on the sides above the German national cross. The third scheme is the same 3 colors in the AMBUSH pattern. It is devoid of any markings. I wish that DML had given some division markings on these and we were told what outfit they were with. The bottom of the page has decal application instructions in 6 languages including English. This kit has a lot of neat features in it.. 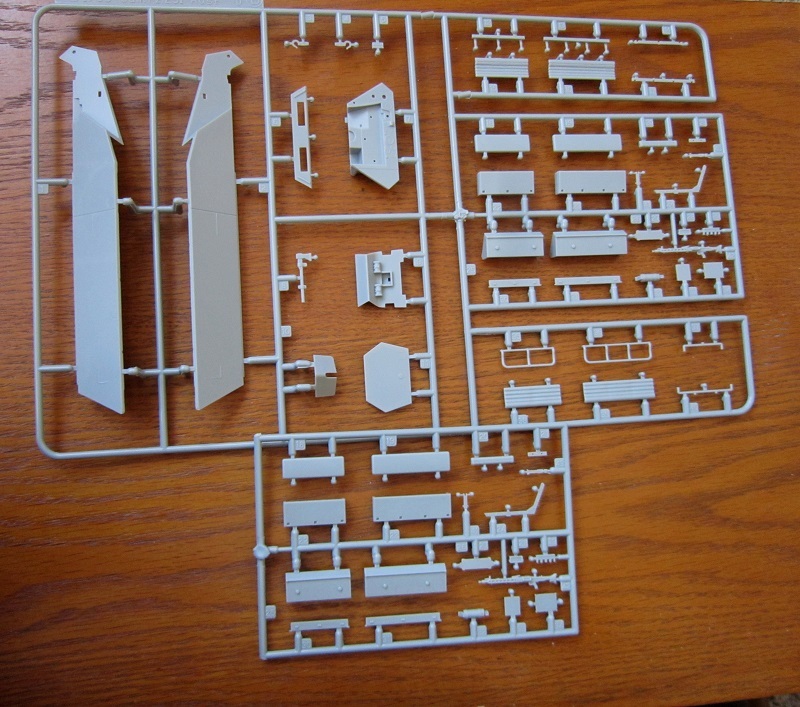 It is definitely not for novice modelers nor a weekend project, with so many parts in it and its complexity. I recommend it to modelers of advanced skills. For what you get this kit is well worth the MSRP asked. I purchased my kit at my local hobby shop back around 2004.